I’ve always thought that a few kale plants in every backyard would go a long way toward solving world hunger. 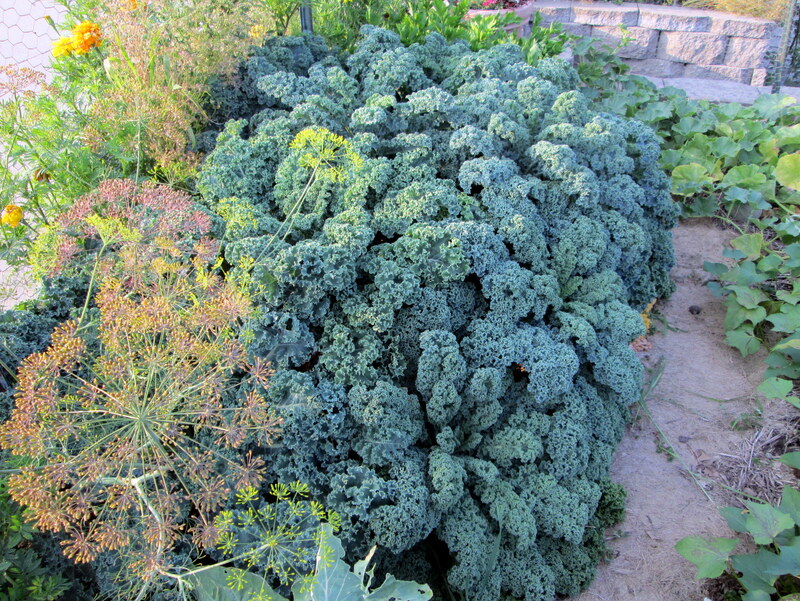 Kale is one of the easiest Brassicas to grow, and it grows prolifically. You can plant kale in the spring and, if you keep picking off leaves as they grow, the plant will continue to produce new leaves well into late fall and even winter. And it need not take up much room in the garden; I’ve learned that four plants are more than enough to keep two people in kale for months. Kale gained fame as a nutritional powerhouse a couple of years ago. While it may no longer be the It superfood (hello, seaweed), this cousin to the cabbage is packed with vitamins A and C and antioxidants like beta-carotene. Kale is rated higher than most vegetables in its ability to absorb free radicals that are linked to disease. Studies have found that eating kale may prevent some cancers and promote urinary health. Eat kale cooked or raw, but if you are looking for the maximum nutritional benefit, raw is best. 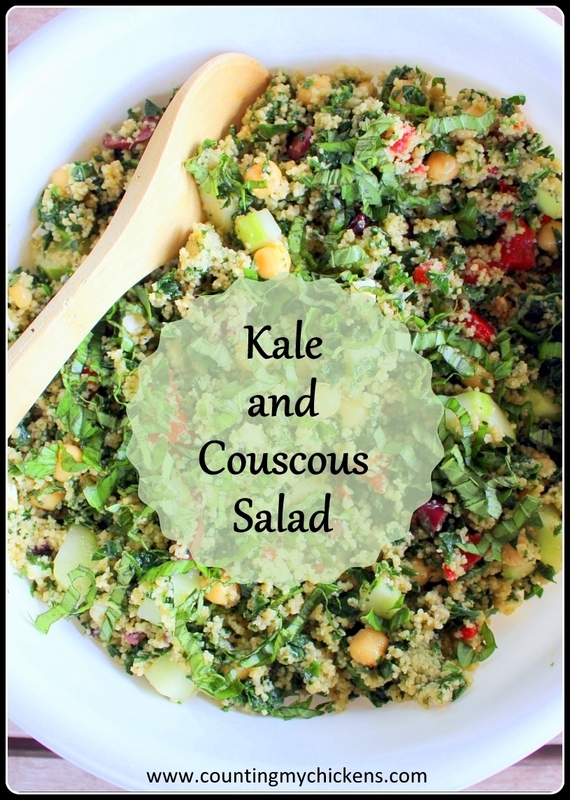 My recipe for Kale and Couscous Salad combines raw kale and other healthy ingredients in a delicious Medeterranean-style salad. The salad makes for a great packable lunch or meatless dinner. This recipe was inspired by a Mediterranean quinoa salad that my friend Heidi brought to a summer holiday potluck. My sister-in-law Jen gets credit for the idea to substitute kale for arugula. I swapped out the quinoa for couscous because I ran out of quinoa. And I added cucumber because I have them coming out of my ears in the garden. 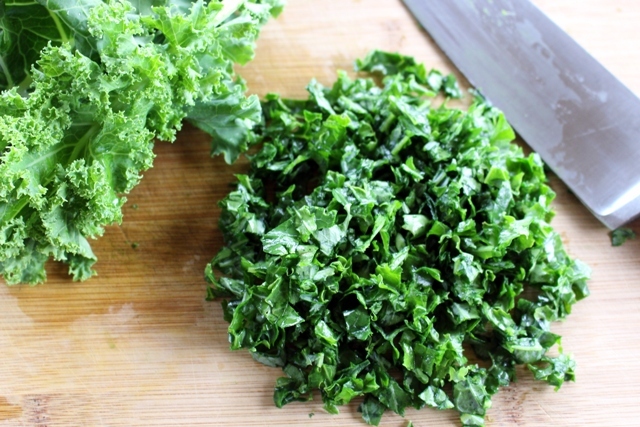 For a successful kale salad, use the youngest, most tender leaves and chop them finely. 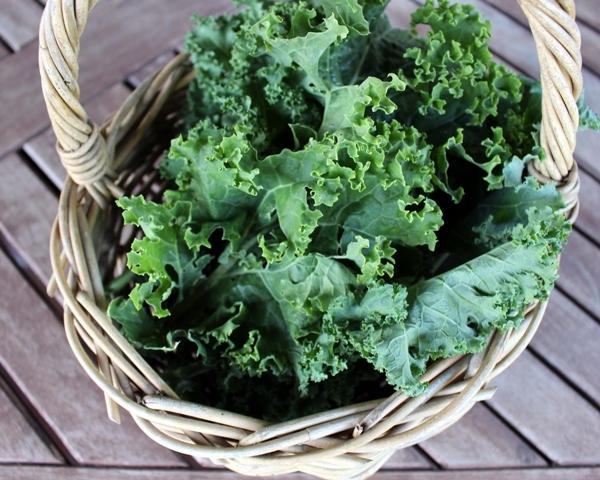 Raw kale benefits from marinating for several minutes in a dressing of olive oil, lemon juice, and salt before serving. Cook couscous according to the directions on the package. Cool completely. Thoroughly wash and drain kale. Remove thick stems and finely chop. Place in a large bowl. Combine 1/4 cup olive oil, lemon juice, salt, and garlic granules. Pour over chopped kale and toss thoroughly to coat. Let stand for 15 minutes. Add couscous, garbanzo beans, red peppers, kalamata olives, feta, cucumber and basil to bowl with kale. Combine remaining 2 tablespoons olive oil with balsamic vinegar and Herbes de Provence in a small bowl. Pour over salad and toss to combine. Season with kosher salt and freshly ground black pepper to taste. This post was shared on the Home Matters Linky Party. This entry was posted in Cooking with Garden Produce and tagged home cooking, kale, recipe, vegetarian by Deborah Neyens. Bookmark the permalink.